It's Not Just A Game is an adventure for GURPS IOU. Illuminati University is not your typical institute of higher learning – and when the students decide to blow off steam with a game of Killer, you can bet it's, well, not just a game. This adventure can be played by just about any high-powered group of GURPS characters as a chance to just slug it out with whoever's in range, just for the fun of it. 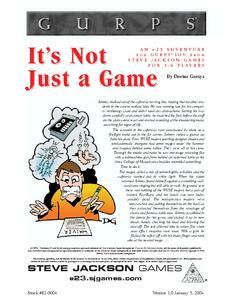 It's Not Just A Game was originally published in Pyramid #22, which you can purchase in its entirety on e23. GURPS IOU – Admit it. College would have been more fun if you were allowed to blow up the instructors. Killer – The exciting live roleplaying game for intelligent, creative and slightly uncivilized people – people who want to knock off their friends . . . without hurting them.